Think of Clear + Brilliant® as the more easygoing little sister of traditional skin resurfacing laser treatments for removing imperfections. Often called the baby Fraxel for having little to no downtime, our nurses love the immediate glowing effects patients see after the first treatment. Clear + Brilliant is a patient favorite for correcting hyper-pigmentation and melasma and producing a smoother skin surface with less visible fine lines and pores. Our patients see the best, most long lasting results when they come in once a month for 4-6 treatments. Come in 30 minutes before your scheduled treatment time for numbing cream. Discontinue use of Accutane for a minimum of 6 months before treatment. Use of a broad-spectrum SPF 30 (or greater) sunblock is necessary for a minimum of 2 week before treatment. Proper use of sunscreen typically requires reapplication every two hours. While not required, we do recommend microdermabrasion 3-5 days before treatment to help exfoliate and prime the skin for enhanced results. Avoid exfoliating agents like Retin-A, acids including alpha or beta hydroxyl, Glycolic, Salicylic, Lactic, etc., hydroquinone or other bleaching creams, and exfoliating gloves/sponges for 3 days before your treatment. Avoid all sun exposure for 48 hours prior to appointment. Do not use any creams, lotions, perfumes, or makeup day of treatment on the desired treatment area. To minimize the potential for adverse effects and boost results, LED light therapy is recommended immediately after treatment, and every other day for up to 2 weeks. Ice pack may be used post treatment to help cool the skin and minimize any discomfort. Any redness should subside within 24 hours after your treatment but in some cases it may last a little longer. To avoid dilation of blood vessels, which decreases the effectiveness of the treatment, avoid hot tubs, hot showers, and exercise for the next 24 hours. Quick, warm showers are recommended. Do not use Retin-A, (or other retinoid containing products), abrasive or exfoliating sponges/scrubs, glycolic, beta, or alcohol containing solutions for a minimum of 5 days. For the first 2-3 days use a gentle milk cleanser, as well as a gentle moisturizer and/or growth factor. Hydrating masks may also be used. No facials for 10 days post treatment. Ultra-Diamond Dermabrasion is recommended 14 days post treatment to optimum results. Continue to use a broad spectrum SPF 30 (or greater) sunblock for a minimum of 6 weeks after treatment to avoid sun induced brown discoloration of the skin. Proper use of sunscreen typically requires reapplication every two hours. Do not pick, rub, or scratch at the skin as this may cause unwanted side effects such as darkening of the skin and/or scarring. We recommended coming in every 4 weeks for face only treatments, and every 5-6 weeks for treatments that include the neck and/or chest, and continue until desired results are achieved. We highly encourage you to make your next appointment before you leave. While Clear + Brilliant can be done in single treatments, it typically takes 4-6 treatments to reach desired results, especially if treating pigmentation concerns. In some cases, such as melasma, more treatment may be required. We recommend purchasing a series for extra savings. If you’re battling the effects aging can have on your skin, or trying to address it before the battle even starts, Clear + Brilliant can help. 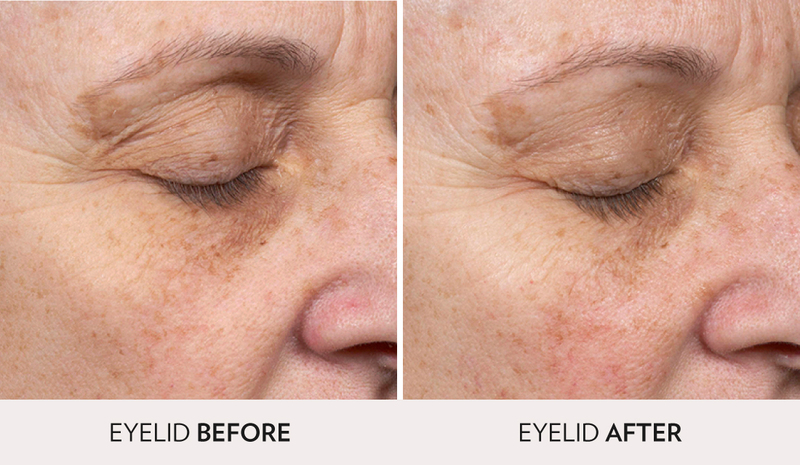 With simple, gentle laser treatments provided by your nurse, you can help prevent the visible signs of aging and address the overall dulling effects time and the environment can have on your skin. This treatment is effective in helping prevent the signs of aging, soften fine lines, improve skin tone and texture, minimize the appearance of pores, and improve the appearance of hyperpigmentation. One Clear + Brilliant session can leave your skin feeling smoother, younger and give you that “radiant glow” that comes from healthy, youthful skin, while routine treatments deliver lasting results. What does Clear + Brilliant laser do? Clear + Brilliant is a laser resurfacing facial treatment that uses pulsating beams of light to exfoliate away layers of skin to reveal a smoother, clearer complexion. It uses the same technology as fraxel—just not nearly as intense so it’s great first time treatment for skin concerns. How often should you do Clear + Brilliant? During your treatment, you may experience some slight discomfort with a warming sensation. We use a special cooling system that helps to lower the temperature of the skin at the treatment site before, during, and after laser exposure. The treatment is generally well tolerated. We can provide you with a topical numbing cream for additional comfort. Please arrive 30 minutes before your scheduled treatment time. A mild to moderate redness and/or sunburned feeling may persist in the treated areas for the next 24 hours, and in some cases it may last longer. Your skin will have a rough texture for approximately 3-5 days after the treatment. In some cases, the rough texture may last longer. What is a typical Clear + Brilliant Treatment? Begins with a consultation with your nurse to see if Clear + Brilliant is right for you. Treatment is about 30 minutes for a complete session. Application of topical numbing cream to your face prior to treatment in order to provide additional comfort. Is delivered by your skin care professional, who will gently guide the Clear + Brilliant hand piece across the target area and actively treat your skin for approximately 15-20 minutes. With Clear + Brilliant Perméa® treatments, a topical antioxidant serum can or might be applied to the skin immediately after treatment. A refreshing biocellulose masque may also be applied for 10–15 minutes after treatment. How does Clear + Brilliant work? Clear + Brilliant works by creating millions of microscopic treatment zones in the upper layers of the skin, which replaces damaged skin with healthy tissue and yields younger looking skin. The number of treatments is tailored to your concerns and skincare desires. In recent studies, consumers reported visible improvements after 4-6 treatments, though many patients choose to have routine maintenance treatments. 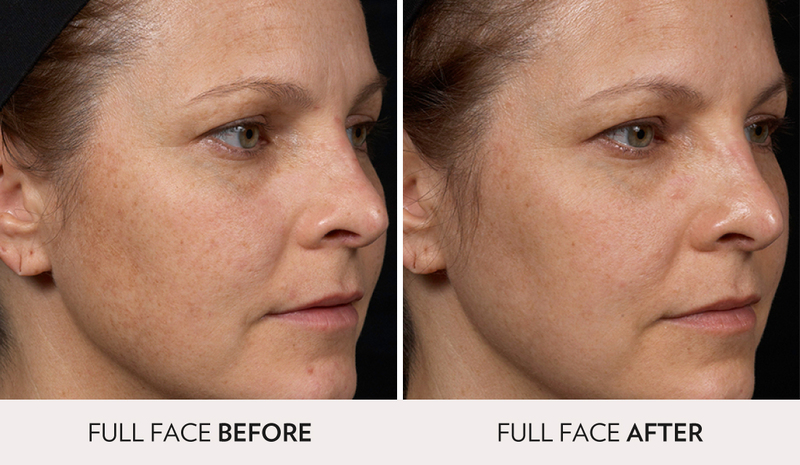 The results of Clear + Brilliant treatment are both immediate and progressive. Within a week or two after one treatment, your skin will start to feel softer, look brighter and show more even tone. Results can last for months depending on age, skin condition, and how you protect your skin.